Sauce is the key of the delicious sirloin steak. 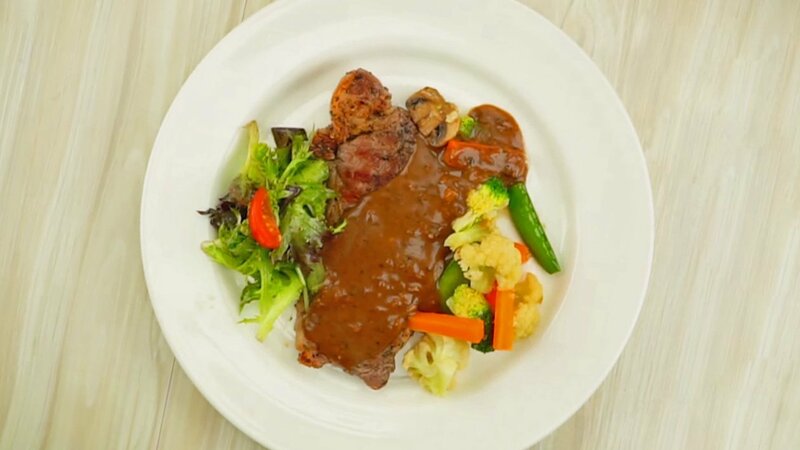 Delicious sirloin steak will mix with luscious blackpepper sauce and make perfect dish. Put water in a pan. Add Knorr Demi Glace Sauce. Heat until thickened, stirring occasionally. Check the viscosity. Turn off the heat and lift the pot from the stove. Heat the oil. Add onions, shallots, garlic, and black pepper. Add the Demiglace that has been mixed with water. Add cooking cream and mix well. Heat until thickened. Turn off the heat and lift the pot from the stove. Sprinkle salt, black pepper, rosemary, thyme and Knorr Beef Powder on the sirloin steak. Heat the roaster. Put sirloin on the roaster. Grill the sirloin steak to done. Place the sirloin on the plate. Place vegetables and salads on both sides. Pour black pepper sauce over sirloin.